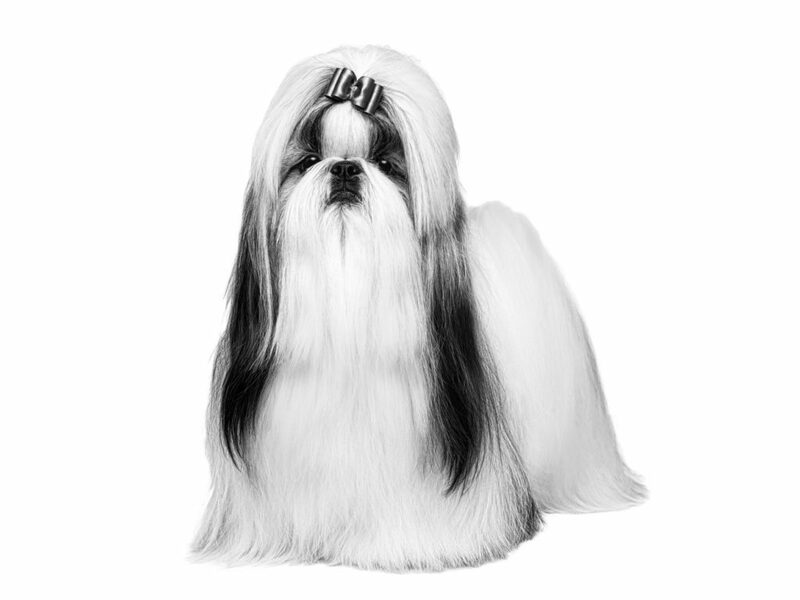 Learn about the Shih Tzu’s history, diet and health to discover what makes this breed unique! Lady Browning is responsible for bringing the Shih Tzu to England in 1930, and by 1933 a breed standard had been drawn up. But where do Shih Tzus come from? The Shih Tzu is thought of as a Chinese breed, as this is where they developed, but their origins almost certainly come from the Lion Dogs of Tibet, which have become today’s Lhasa Apso. “Broad” is a good descriptor for this breed, both in body and face! The Shih Tzu’s body is fairly long, with short legs and a high set tail carried gaily curled over the back. It is the face which gives the Chrysanthemum dogs its name, as from its short broad muzzle, the hair grows upwards between large round eyes – resembling a chrysanthemum flower. The Shih Tzu has an abundant coat, long and dense with a thick undercoat and a heavy plume on the tail. Due to the long and abundant coat fur, this breed is prone to shedding. Therefore, Shih Tzu grooming should never be neglected or underestimated; they need to be brushed daily in order to maintain good skin and coat health. Lively, active and outgoing, the Shih Tzu does enjoy attention and dislikes being alone. The Shih Tzu’s intelligence is also renowned and revered within the dog owner community. A Shih Tzu’s temperament is typically relaxed yet determined – they can be strong willed and like to do things their way. Essentially, they are a lap dog with attitude, meaning Shih Tzu training can sometimes be challenging, but always fun and beneficial. Lively and friendly, the Shih Tzu puppy grows quickly from a small ball of fluff into a dignified and robust adult; all within 10 months. Despite this quick rate of growth, the right Shih Tzu puppy care is still vital. During its puppy years, the Shih Tzu’s coat grows in magnificence, but to reach its peak, it will need the correct nutrition, amino acids, vitamins, minerals and omega fatty acids. Ideal Shih Tzu puppy food: ROYAL CANIN® Shih Tzu Puppy. Daily grooming and good nutrition are both essential to keep the Shih Tzu’s magnificent coat in peak condition while supporting the sensitive skin underneath. Furthermore, the best food for Shih Tzus will contain quality protein, selected vitamins and minerals and a supply of Omega fatty acids (both Omega 3 and Omega 6); these are all required for a sufficiently nutritional Shih Tzu diet. The Shih Tzu is a brachycephalic breed, meaning that it has a broad head and short muzzle. This can make picking up flat biscuits a challenge, which is why a diet with a specifically adapted kibble – to make it easier to pick up and crunch – is recommended. This will also have dental benefits, which is particularly important for smaller breeds as they are generally more prone to dental concerns.